I open up my mailbox this week, and what do I pull out? My new “Bottom Line Health” magazine. It includes wellness strategies from the world’s leading medical experts. The front page article was …. 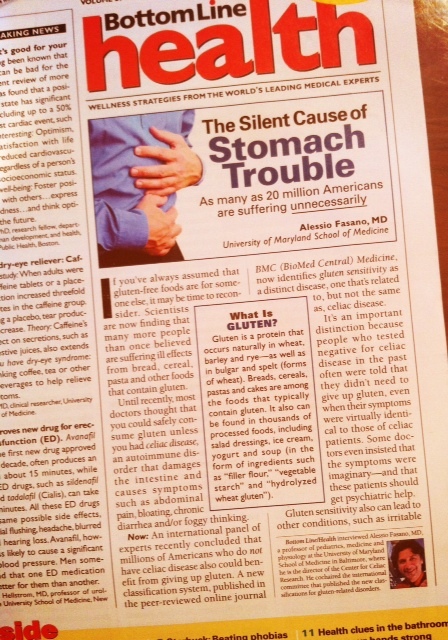 “The Silent Cause of Stomach Trouble…” (As many as 20 million Americans are suffering unnecessarily) by Alessio Fasano, MD. The article went on to explain that an international panel of experts are talking about non-celiac gluten sensitivity issues. Praise God! They shared how doctors, for years, have insisted that symptoms were imaginary… and how they pushed patients to get psychiatric help. But, I can see how things go down that path after experiencing a similar response first hand. Even this “most recent” article seemed to be months/years behind in not having answers how people can get tested for gluten sensitivity issues. How about GENE testing to ENSURE you don’t have a gluten sensitivity gene, or a celiac gene – to rule out the permanent damage and chronic inflammation factor? The book, “Healthier Without Wheat”, shares the importance of being gluten-free for even non-celiac gluten intolerance. Stories are shared from parents who weren’t told that even if a test comes back negative to celiac initially, and yet the genes are THERE – continued exposure will increase the changes to triggering celiac and other major diseases, like cancer. Doesn’t it make sense to do gene testing right off the bat so a person can know if their geno-type? The bottom line is, if the genetics are there – then you shouldn’t be eating gluten… otherwise, you’re just increasing your chances of activating the autoimmune disease, or allowing gluten to destroy your body in a whole host of other major ways. It’s not a matter of IF it will cause problems… it’s a matter of WHEN. So, you might be wondering WHY is this all coming to a head for so many people right now? Why is a disease I’ve never heard about (Celiac) and things like gluten sensitivity – everywhere all of a sudden, and why are diets like Paleo and Vegetarian talked about SO much. Is it because everyone is on a health kick? Is it a fad, like some suggest, to just lose weight? Or are we putting the pieces together of the REASONS of rising health care nightmare in our country and we’re making lifestyle choices to avoid what a majority of people are experiencing? Excess of chemically engineered food for convenience pushed through the FDA + lack of study on nutrition in the medical field + poor diet = a HUGE role in this health mess for all of us. Many people interested in nutrition have seen the typical documentaries on our food sources… Hungry for Change, Fat, Sick and Nearly Dead, Fresh, Forks Over Knives, The Engine 2 Rescue, Supersize Me… the list goes on an on. (If you don’t have a Netflix subscription – you could be educated for hours on what is going on in our food industry, and it can be pretty shocking if you’re in the dark.) More importantly – you can begin to evaluate what those options are doing to our society as a whole, or within your own family… and decide what changes need to be made for the future of your health. Fantastic. “No idea what effect….” Have you ever felt like a test rat? Fabulous. I’m a neat-nick… and a germo-phobe. One more strike against my kids for the environmental factor trigger! *sigh* But the issues regardng our chemically engineered food being such an issue makes COMPLETE sense for an increase in cases! What could medical doctors glean from this? Genetic testing needs to be an option when the “simple” antibody blood test doesn’t show anything and the sometimes irrelevant upper GI biopsy doesn’t show anything either and the symptoms are all there. As a patient, please don’t give up if you are struggling for answers. If you’re suffering digestively in any way, OR with neuropathy symptoms, thyroid issues, asthma or unexplained rashes and ailments… keep on your doctor or do the tests needed OR if that doesn’t work – get an at home test from Enterolab.com. You shouldn’t believe everything thing you see/hear on the internet… but I’m a HUGE believer in self-educating. Keep reading, and putting the pieces together so you and YOUR family can be HEALTHY FOR HIM. ** Quoted information from Murray’s studies were found in the downloadable book “21st Century Medical Sourcebook, Celiac Disease, Gluten Intolerance – Clinical Data and Practical Information.” that was updated in March of 2012. Here it is! 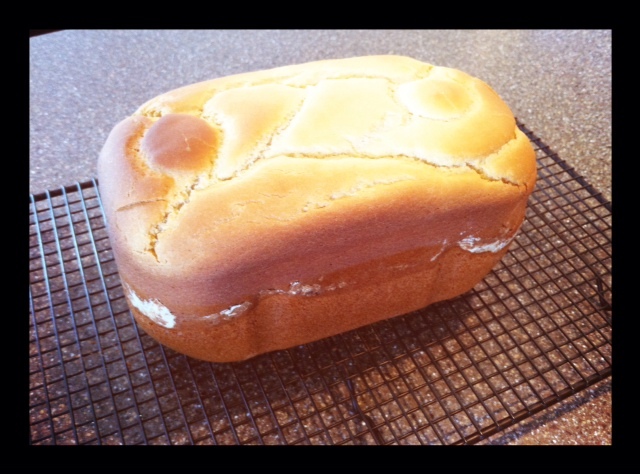 My 20th loaf of bread, and perhaps my tallest one yet! 🙂 It needed a bit more Xanthum Gum – but the kids loved the taste! Posted on June 27, 2012, in Celiac/Gluten Sensitivity, Diet, Our Struggles, Truth and tagged celiac disease, celiac testing, celiacs, GI testing for celiac disease, gluten intolerance, gluten sensitivity, testing for gluten sensitivity. Bookmark the permalink. Leave a comment.